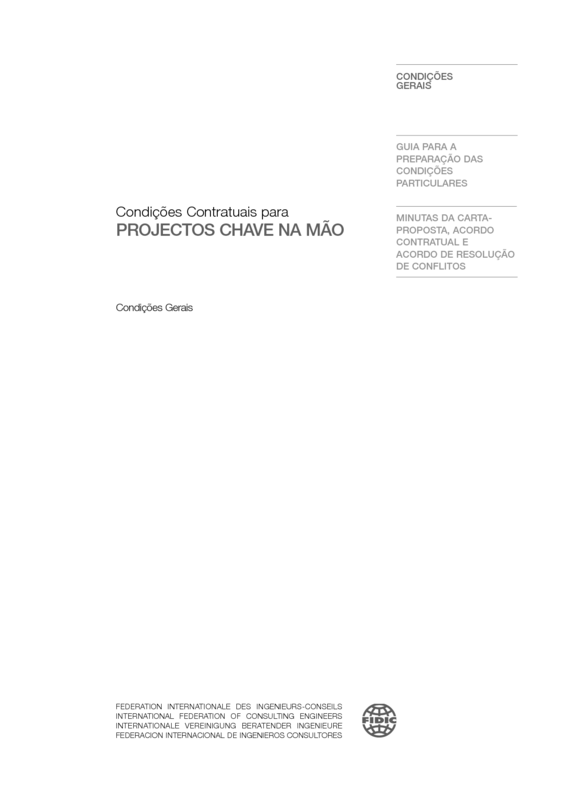 Conditions of Contract for EPC Turnkey Projects (First Edition, 1999). General Conditions; Guidance for the Preparation of Conditions Particular Application; Forms of Tender and Agreement, etc. European International Contractors (EIC) Contractors Guide to the FIDIC Conditions of Contract for EPC/Turnkey Projects (The EIC Silver Book Guide), 2nd Edition, 2003. Conditions of Contract for EPC Turnkey Projects, which are recommended where one entity takes total responsibility for the design and execution of an engineering project. Under the usual arrangements for this type of contract, the entity carries out all the Engineering, Procurement and Construction: providing a fully-equipped facility, ready for operation (at the "turn of the key"). This type of contract is usually negotiated between the parties. FIDIC's Red and Yellow Books (i.e. 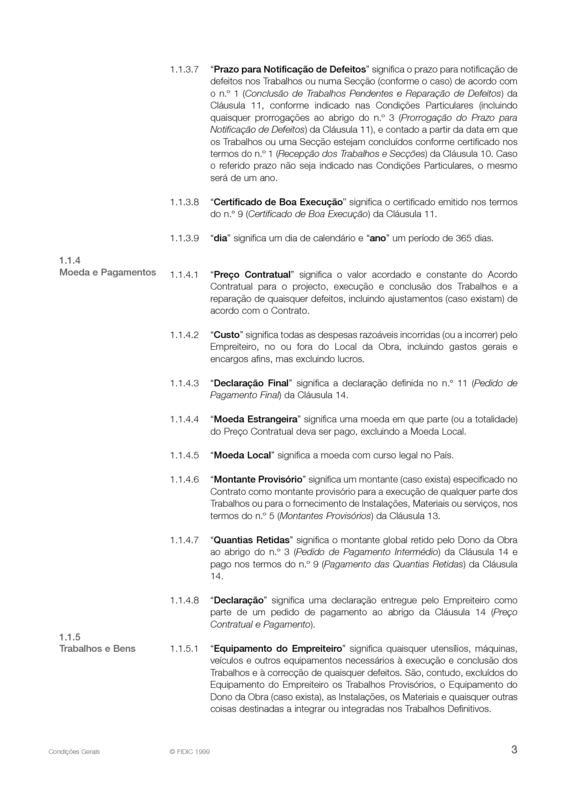 standard forms of contract for works of civil engineering construction and for electrical and mechanical works) have been in widespread use for several decades, and have been recognised - among other things - for their principles of fair and equitable risk sharing between the Employer and the Contractor. These risk sharing principles have been beneficial for both parties, the Employer signing a contract at a lower price and only having further costs when particular unusual risks actually eventuate, and the Contractor avoiding pricing such risks which are hard to evaluate. These risk sharing principles are continued in the new updated versions of the Red and Yellow Books. During recent years it has been noticed that much of the construction market requires a form of contract where certainty of final price, and often of completion date, are of extreme importance. Employers on such turnkey projects are willing to pay more - often considerably more - for their project if they can be more certain that the agreed final price will not be exceeded. Among such projects can be found many projects financed by private funds, where the lenders require greater certainty about a project's costs to the Employer than is allowed for under the allocation of risks provided for by FIDIC's traditional forms of contracts. Often the construction project (the EPC - Engineer, Procure, Construct - Contract) is only one part of a complicated commercial venture, and financial or other failure of this construction project will jeopardize the whole venture. For such projects it is necessary for the Contractor to assume responsibility for a wider range of risks than under the traditional Red and Yellow Books. To obtain increased certainty of the final price, the Contractor is often asked to cover such risks as the occurrence of poor or unexpected ground conditions, and that what is set out in the requirements prepared by the Employer actually will result in the desired objective. If the Contractor is to carry such risks, the Employer obviously must give him the time and opportunity to obtain and consider all relevant information before the Contractor is asked to sign on a fixed contract price. The Employer must also realize that asking serious contractors to price such risks will increase the construction cost and result in some projects not being commercially viable. Even under such contracts the Employer does carry certain risks such as the risks of war, terrorism and the like and the other risks of Force Majeure, and it is always possible, and sometimes advisable, for the Parties to discuss other risk sharing arrangements before entering into the Contract. In the case of BOT (Build - Operate - Transfer) projects, which are normally negotiated as a package, the allocation of risk provided for in the turnkey construction Contract negotiated initially between the Sponsors and the EPC Contractor may need to be adjusted in order to take into account the final allocation of all risks between the various contracts forming the BOT package. Apart from the more recent and rapid development of privately financed projects demanding contract terms ensuring increased certainty of price and performance, it has long been apparent that many employers, particularly in the public sector, in a wide range of countries have demanded similar contract terms, at least for turnkey contracts. They have often irreverently taken the FIDIC Red or Yellow Books and altered the terms so that risks placed on the Employer in the FIDIC Books have been transferred to the Contractor, thus effectively removing FIDIC's traditional principles of fair and equitable risk sharing. This need of many employers has not gone unnoticed, and FIDIC has considered it better for all parties for this need to be openly recognised and regularised. By providing a standard FIDIC form for use in such contracts, the Employer's requirements for more risk to be taken by the Contractor are clearly stated. Thus the Employer does not have to attempt to alter a standard form intended for another risk arrangement, and the Contractor is fully aware of the increased risks he must bear. Clearly the Contractor will rightly increase his tender price to account for such extra risks. This form for EPC Turnkey Projects is thus intended to be suitable, not only for EPC Contracts within a BOT or similar type venture, but also for all the many projects, both large and smaller, particularly E & M (Electrical and Mechanical) and other process plant projects, being carried out around the world by all types of employers, often in a civil law environment, where the government departments or private developers wish to implement their project on a fixed-price turnkey basis and with a strictly two party approach. Employers using this form must realise that the ‘Employer's Requirements' which they prepare should describe the principle and basic design of the plant on a functional basis. The Tenderer should then be permitted and required to verify all relevant information and data and make any necessary investigations. He shall also carry out any necessary design and detailing of the specific equipment and plant he is offering, allowing him to offer solutions best suited to his equipment and experience. Therefore the tendering procedure has to permit discussions between the Tenderer and the Employer about technical matters and commercial conditions. All such matters, when agreed, shall then form part of the signed Contract. Thereafter the Contractor should be given freedom to carry out the work in his chosen manner, provided the end result meets the performance criteria specified by the Employer. Consequently, the Employer should only exercise limited control over and should in general not interfere with the Contractor's work. Clearly the Employer will wish to know and follow progress of the work and be assured that the time programme is being followed. He will also wish to know that the work quality is as specified, that third parties are not being disturbed, that performance tests are met, and otherwise that the ‘Employer's Requirements' are being complied with. A feature of this type of contract is that the Contractor has to prove the reliability and performance of his plant and equipment.Therefore special attention is given to the ‘Tests on Completion', which often take place over a considerable time period, and Taking Over shall take place only after successful completion of these tests. FIDIC recognizes that privately-financed projects are usually subject to more negotiation than publicly-financed ones and that therefore changes are likely to have to be made in any standard form of contract proposed for projects within a BOT or similar type venture. Among other things, such form may need to be adapted to take account of the special, if not unique, characteristics of each project, as well as the requirements of lenders and others providing financing. Nevertheless, such changes do not do away with the need of having a standard form. Fédération Internationale des Ingénieurs-Conseils (FIDIC) extends special thanks to the following members of its Update Task Group: Christopher Wade (Group Leader), SWECO-VBB, Sweden; Peter L Booen (Principal Drafter), GIBB Ltd, UK; Hermann Bayerlein, Fichtner, Germany; Christopher R Seppala (Legal Adviser), White & Case, France; and José F Speziale, IATASA, Argentina. The preparation was carried out under the general direction of the FIDIC Contracts Committee comprising John B Bowcock, Consulting Engineer, UK (Chairman); Michael Mortimer-Hawkins, SwedPower, Sweden; Axel-Volkmar Jaeger, Schmidt Reuter Partner, Germany; and Hiroyuki Endo, Pacific Consultants, Japan. Various drafts were reviewed by the following persons or organisations: Mushtaq Ahmad, NESPAK, Pakistan; Peter Batty, Post Buckley International, USA; Manfred Breege, Lahmeyer International, Germany; Pablo Bueno, TYPSA, Spain; Nael G Bunni, Consulting Engineer, Ireland; Ian Fraser, Beca Carter Hollings & Ferner, New Zealand; Roy Goode, Oxford University, UK; Dan W Graham, Bristows Cooke & Carpmael, UK; Mark Griffiths, Griffiths & Armour, UK; Geoffrey F Hawker, Consulting Engineer, UK; Hesse & Steinberger, VDMA, Germany; Poul E Hvilsted, Elsamprojekt, Denmark; Gordon L Jaynes, Whitman Breed Abbott & Morgan, UK; Tonny Jensen (Chairman of FIDIC Quality Management Committee), COWI, Denmark; Philip Loots & Associates, South Africa; Neil McCole, Merz and McLellan, UK; K B (Tony) Norris, Consulting Engineer, UK; Eric Petersen, CEGELEC, France; Matthew Needham-Laing, Victoria Russell & Paul J Taylor, Berrymans Lace Mawer, UK; David R Wightman & Gerlando Butera, Nabarro Nathanson, UK; the Association of Japanese Consulting Engineers; European International Contractors; Organisme de Liaison Industries Métalliques Européennes ("ORGALIME"); the International Association of Dredging Contractors; the International Bar Association; the Asian Development Bank; and the World Bank. 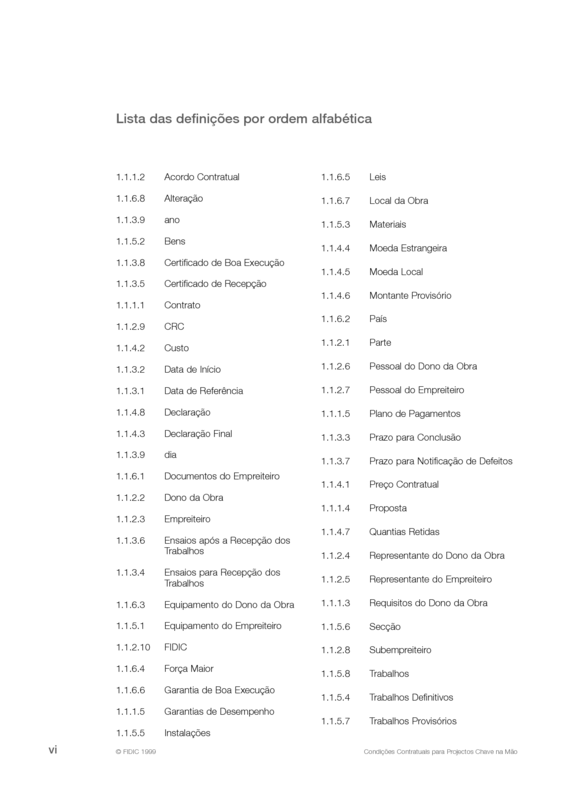 Conditions of Contract for Construction, which are recommended for building or engineering works designed by the Employer or by his representative, the Engineer. Under the usual arrangements for this type of contract, the Contractor constructs the works in accordance with a design provided by the Employer. However, the works may include some elements of Contractor-designed civil, mechanical, electrical and/or construction works. Conditions of Contract for Plant and Design-Build, which are recommended for the provision of electrical and/or mechanical plant, and for the design and execution of building or engineering works. Under the usual arrangements for this type of contract, the Contractor designs and provides, in accordance with the Employer's requirements, plant and/or other works; which may include any combination of civil, mechanical, electrical and/or construction works. Short Form of Contract, which is recommended for building or engineering works of relatively small capital value. Depending on the type of work and the circumstances, this form may also be suitable for contracts of greater value, particularly for relatively simple or repetitive work or work of short duration. Under the usual arrangements for this type of contract, the Contractor constructs the works in accordance with a design provided by the Employer or by his representative (if any), but this form may also be suitable for a contract which includes, or wholly comprises, Contractor-designed civil, mechanical, electrical and/or construction works. The forms are recommended for general use where tenders are invited on an international basis. Modifications may be required in some jurisdictions, particularly if the Conditions are to be used on domestic contracts. FIDIC considers the official and authentic texts to be the versions in the English language. In the preparation of these Conditions of Contract for EPC/Turnkey Projects, it was recognised that, while there are many sub-clauses which will be generally applicable, there are some sub-clauses which must necessarily vary to take account of the circumstances relevant to the particular contract. The sub-clauses which were considered to be applicable to many (but not all) contracts have been included in the General Conditions, which will facilitate their incorporation into each contract. The General Conditions and the Particular Conditions will together comprise the Conditions of Contract governing the rights and obligations of the parties. 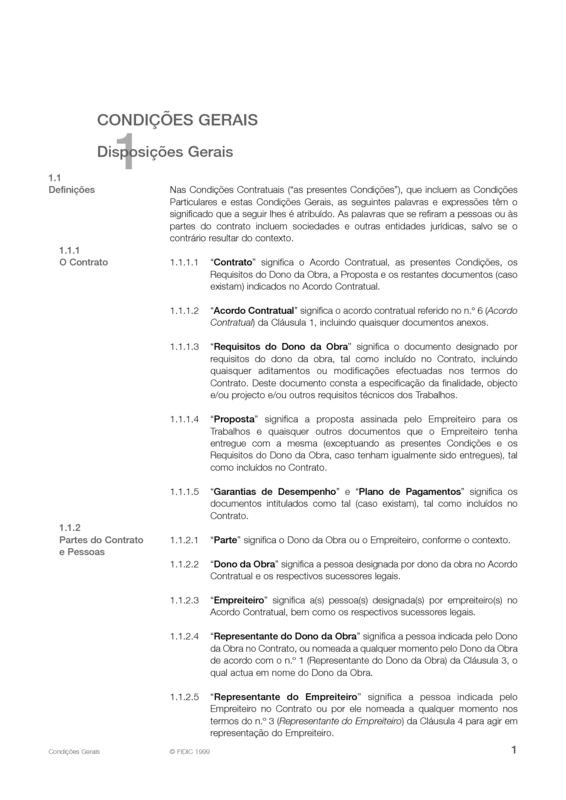 It will be necessary to prepare the Particular Conditions for each individual contract, and to take account of those sub-clauses in the General Conditions which mention the Particular Conditions. (b) in other cases, where the application of (a) was thought to be inappropriate, the sub-clause contains the provisions which were considered applicable to most contracts. For example, Sub-Clause 14.2 [Advance Payment]is included for convenience, not because of any FIDIC policy in respect of advance payments. This Sub-Clause becomes inapplicable (even if it is not deleted) if it is disregarded by not specifying the amount of the advance. It should therefore be noted that some of the provisions contained in the General Conditions may not be appropriate for an apparently-typical contract. Further information on these aspects, example wording for other arrangements, and other explanatory material and example wording to assist in the preparation of the Particular Conditions and the other tender documents, are included within this publication as Guidance for the Preparation of the Particular Conditions. Before incorporating any example wording, it must be checked to ensure that it is wholly suitable for the particular circumstances; if not, it must be amended. Where example wording is amended, and in all cases where other amendments or additions are made, care must be taken to ensure that no ambiguity is created, either with the General Conditions or between the clauses in the Particular Conditions. It is essential that all these drafting tasks, and the entire preparation of the tender documents, are entrusted to personnel with the relevant expertise, including the contractual, technical and procurement aspects. 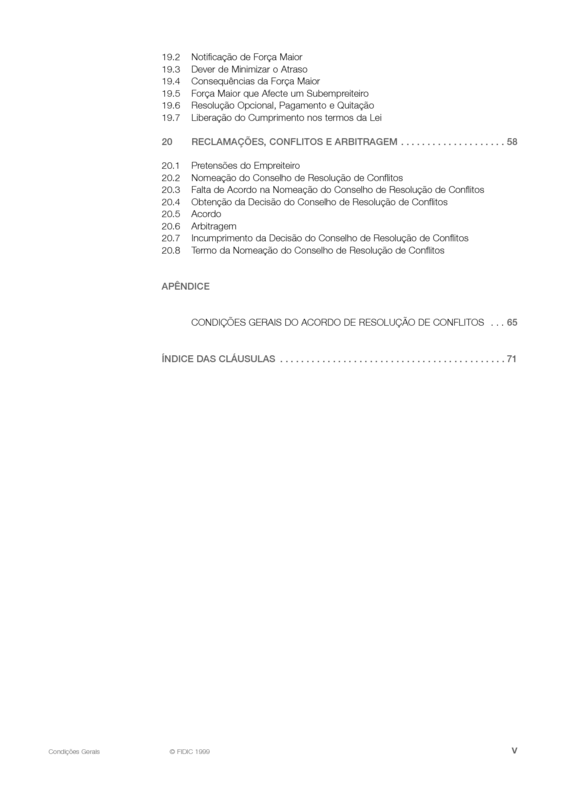 This publication concludes with example forms for the Letter of Tender, the Contract Agreement, and alternatives for the Dispute Adjudication Agreement. This Dispute Adjudication Agreement provides text for the agreement between the Employer, the Contractor and the person appointed to act either as sole adjudicator or as a member of a three-person dispute adjudication board; and incorporates (by reference) the terms in the Appendix to the General Conditions. FIDIC intends to publish guides to the above Conditions of Contract. Another relevant FIDIC publication is "Tendering Procedure", which presents a systematic approach to the selection of tenderers and the obtaining and evaluation of tenders. 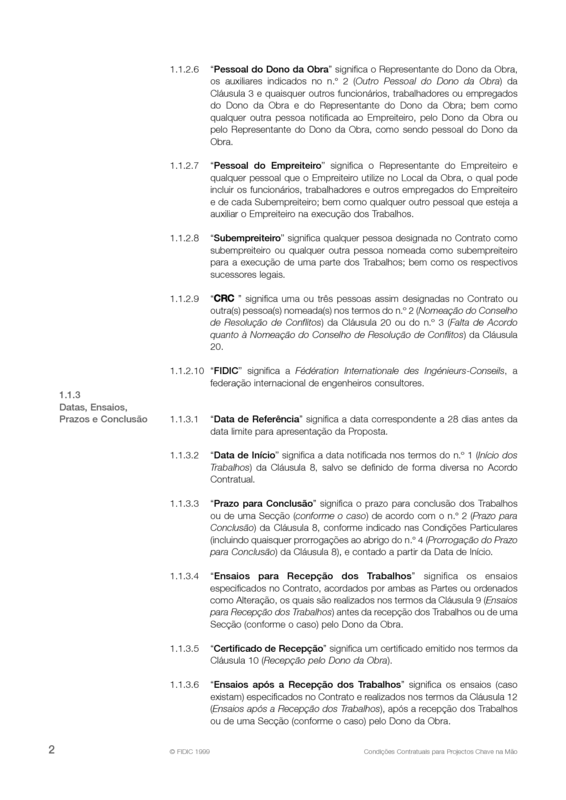 In order to clarify the sequence of Contract activities, reference may be made to the charts on the next two pages and to the Sub-Clauses listed below (some Sub-Clause numbers are also stated in the charts). The charts are illustrative and must not be taken into consideration in the interpretation of the Conditions of Contract. The terms of the Conditions of Contract for EPC Turnkey Projects have been prepared by the Fédération Internationale des Ingénieurs-Conseils (FIDIC) and are recommended where one entity takes total responsibility for an engineering project, including design, manufacture, delivery and installation of plant, and the design and execution of building or engineering works, tenders having been invited on an international basis. Modifications to the Conditions may be required in some legal jurisdictions, particularly if they are to be used on domestic contracts. Major turnkey projects may require some negotiation between the parties. Having studied the variety of options offered by tenderers, the Employer may consider it essential to meet and discuss with them the technical options which the Employer considers preferable. Under the usual arrangements for this type of contract, the Contractor carries out the Engineering, Procurement and Construction, and provides a fully-equipped facility, ready for operation (at the "turn of the key"). The Employer's representative, if there is one, is not required to act impartially. The guidance hereafter is intended to assist writers of the Particular Conditions by giving options for various sub-clauses where appropriate. As far as possible, example wording is included, in italics. In some cases, however, only an aide-memoire is given. Before incorporating any example wording, it must be checked to ensure that it is wholly suitable for the particular circumstances. Unless it is considered suitable, example wording should not be used without amendment. Where example wording is amended, and in all cases where other amendments or additions are made, care must be taken to ensure that no ambiguity is created, either with the General Conditions or between the clauses in the Particular Conditions. The Conditions of Contract comprise the "General Conditions", which form part of the "Conditions of Contract for EPC Turnkey Projects" First Edition 1999 published by the Fédération Internationale des Ingénieurs-Conseils (FIDIC), and the following "Particular Conditions", which include amendments and additions to such General Conditions. FIDIC has published a document entitled "Tendering Procedure" which presents a systematic approach to the selection of tenderers and the obtaining and evaluation of tenders; the second edition was published in 1994. The document is intended to assist the Employer to receive sound competitive tenders with a minimum of qualifications. FIDIC intends to update Tendering Procedure and to publish a guide to the use of these Conditions of Contract for EPC Turnkey Projects. 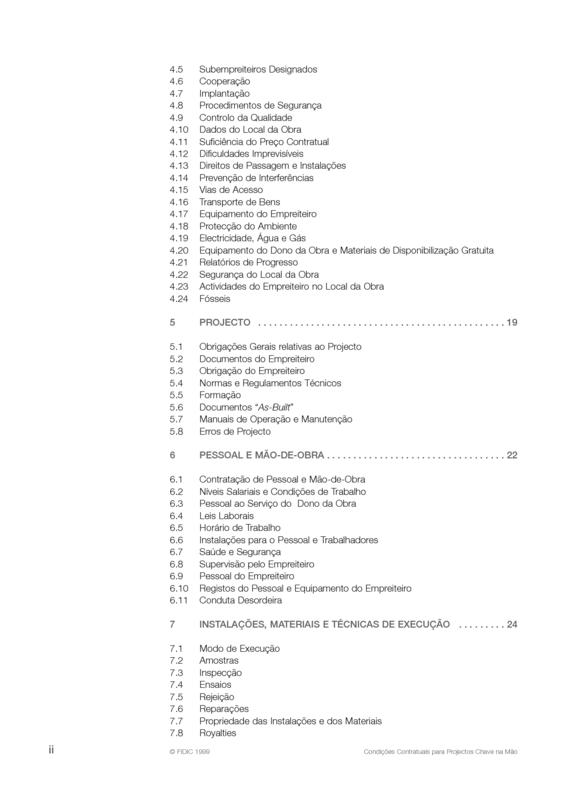 Conditions of Contract for Design-Build and Turnkey (1st Edition, 1995). Part 1: General Conditions; Part 2: Guidance for the Preparation of Conditions Particular Application.